FOR companies that aim to boost competitiveness and gain access to overseas markets with their products, getting certified by an accredited testing laboratory is key. 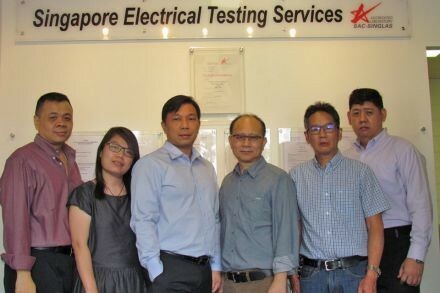 Singapore Electrical Testing Services (Sets) is one such firm that understands all too well the importance of recognised accreditation to help its clients build trust and internationalise. Established in 1995, it provides testing services for a wide range of wiring accessories and switchgear products for various countries in the world. Sets' original purpose was to be the in-house test laboratory for the company's testing validation and assurance programmes. But this changed in 2000, when the decision was made to accredit Sets under the Singapore Accreditation Council's Singapore Laboratory Accreditation Scheme (SAC-SINGLAS) to ISO Guide 25 for Electrical Testing. It was subsequently upgraded to the ISO/IEC 17025, which is the global standard for testing labs. Attaining such accreditation means that Sets is able to test its own products under the accredited scope of testing. The reasons for getting accredited back then was due to the fast-growing demand for accredited testing and the need to reduce the testing turnaround time, which was crucial for their products to be launched in the market in a timely fashion. "It has become a key requirement to obtain accreditation before offering certain services and therefore, it is deemed to be a de facto 'passport' in our business, which clients expect us to offer," says Robin Soon, head of Sets. He shares that the benefits of getting SAC accredited are manifold. Firstly, it provides independent assurance that the evaluations and results generated by the company are reliable and credible. The accreditation also builds local and international confidence among customers as it gives Sets a reputation as an ethical and responsible testing services provider. "It has set us apart from the competition, and enabled us to compete with larger organisations on the similar platform," adds Mr Soon. Mostly importantly, with the SAC accreditation, the company is qualified to bear the International Laboratory Accreditation Cooperation - SAC (ILAC-SAC) mark on its test reports, which is recognised and accepted internationally. It also allows Sets to be a designated listed testing lab under the Asean Electrical and Electronic Mutual Recognition Agreement (EE MRA) as well as a recognised testing lab under the Consumer Protection Scheme (CPS) from the Safety Authority - Spring Singapore for testing of controlled goods in Singapore. In particular, the Asean EE MRA reduces trade barriers by allowing regulated electrical and electronic equipment made in Asean to be exported to member countries as long as they have been approved by a listed certified body or testing lab. By reducing the need for repeated testing, it leads to lower compliance costs, a shorter time to market, and higher certainty for new product launches. As a result, for companies that intend to break into overseas markets, utilising the services of an SAC accredited testing firm such as Sets opens many doors. With their accredited test reports, Mr Soon says that clients of Sets can be confident that their product has been thoroughly evaluated using international standards and the respective countries' national deviations. Such reports also ensure international acceptance of test data and facilitate trade. "The product tested in a particular country by an accredited lab minimises the chances of retesting and reducing the chances of additional financial burden and time delays under the common recognition framework," he says. A client that engaged its accredited testing services is Clipsal Manufacturing Kuala Lumpur, which has since penetrated into the Hong Kong, Middle East, United Kingdom, New Zealand and other Asean markets. But while Sets has certainly reaped many benefits from accreditation, the journey to get to where it is now is not an entirely smooth sailing one. Mr Soon says that the company has had to overcome several obstacles. Firstly, there was the need to convince management of the need to build an accredited lab. After all, there will always be people reluctant for change to take place. There is also extensive preparation needed to become an accredited lab. Mr Soon highlights the first SAC-SINGLAS assessment, the Asean EE MRA and the CPS scheme audit as some of the hurdles it had to cross along the way. As the testing business is a niche market, it was also not easy recruiting competent personnel. Other challenges that the company faced in its road to accreditation included ensuring and upholding impartiality as an accredited lab, as well as fending off competition from other players in the testing business. But now, with accreditation under its belt, Sets has come a long way from its humble beginnings. Not only can it boast of faster testing turnaround times and credible results, the company can now provide testing support to standards developers during the verification stage of new revisions and a faster response time to clients when failures occur during the testing process. The latter is especially critical to new range of product launches, adds Mr Soon. All in all, SETS has certainly reaped the benefits of going the extra mile to attain accreditation, gaining a competitive advantage not just for itself, but for its clients who wish to go abroad.